What sports fan doesn’t love a buzzer beater shot to win the game? Or a touchdown play as time winds down. There’s not much more exciting than witnessing victory being snatched from the jaws of defeat at the last possible second. For me, it’s very similar to the thrill I get chasing big crappies as time expires on the hardwater season. I know that as soon as that dependable mid-season crappies pattern of being suspended over the basin begins to fall apart, it’s time to go into my hurry up offense in order to score on some buzzer beater slabs. Late season ice fishing is a time of transition…for both the fish and the slab of ice we fish on. The days are growing longer, temperatures are on the rise and a slow meltdown is set in motion. 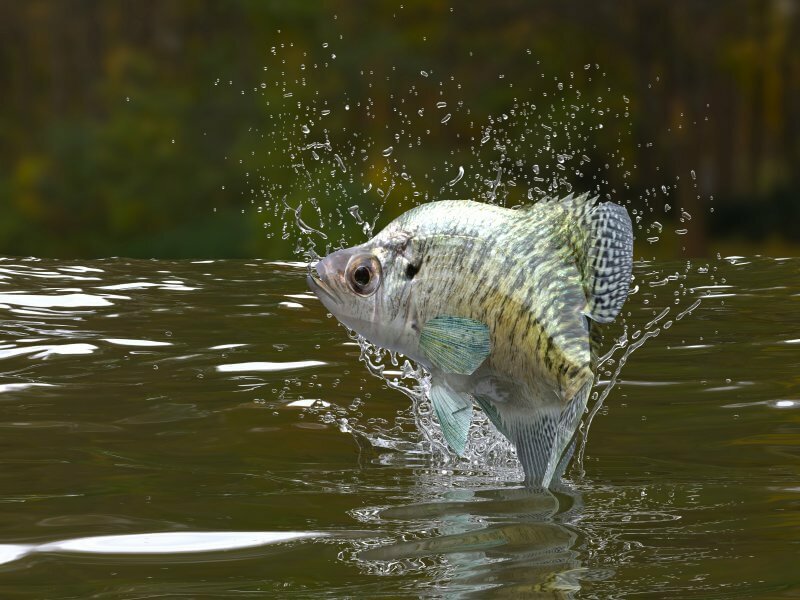 This melt eventually enters the lakes and ponds…only a trickle at first…bringing slightly warmer water temperatures as well as replenishing oxygen and carrying nutrient rich sediment into the world of the crappie. 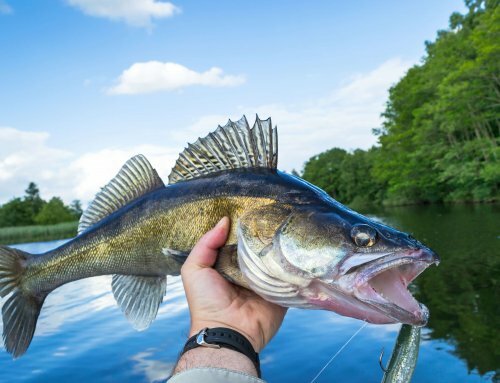 The warmer water and longer days begin to slowly wake fish from the mid-winter funk they’ve been in for several weeks now as their metabolisms suddenly start to flicker to life. The increase in daylight and life-awakening runoff also triggers increased invertebrate and aquatic insect activity and jumpstarts the re-growth of aquatic vegetation. The whole biological machine of every body of water in the ice belt is slowly waking up, yawning, stretching, rubbing its eyes and building up a head of steam towards another open water season. All these things serve as a trigger and will play an important role in determining where and how we catch crappies in what will be our last few trips out onto the frozen lakes. 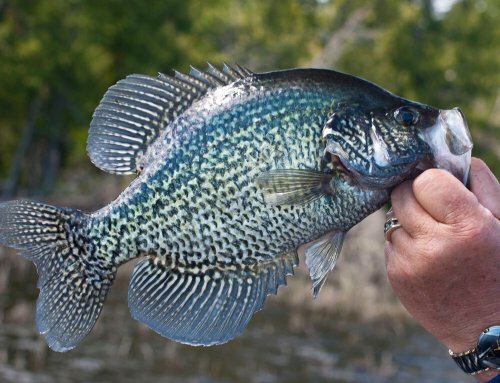 For the past several weeks crappies have been found suspended over large basin areas of lakes as they aimlessly roam the large vast expanses of that featureless water, feeding when opportunity knocks, sometimes in what seems to be a state of suspended animation. It has been a long cold winter below the ice. Food sources and oxygen levels have dwindled; they have been preyed upon by their natural predators and chased by their human predators with every jig and lure known to man. They are tired, cold and beginning to get very hungry. The spawn is only weeks away and a lot of calories will need to be consumed between now and then in order to sustain the energy levels needed for a successful spawn. Crappies are simply waiting for spring to arrive as anxiously as some humans are above the ice. Suddenly, on the next trip out, the crappies are gone from those basin areas. There are a few stragglers that remain, but the days of a mark in every hole or finding pods or schools suspended over deeper water are definitely gone. So where did they go? The warming water, the sprouting of new aquatic vegetation and the up-tick in aquatic insect life has not gone unnoticed by the crappies. Like a moth to a flame they are drawn towards it. The increase in bugs in the water fills their empty stomachs and stokes the fires for the upcoming spawn. The newly sprouted weeds give them cover and attract baitfish for them to feed on and the warmer waters bring an end to their midwinter funk and ramp up their metabolism. The late ice period is a time of transition for crappies as they slowly move from their deep-water suspension towards warmer, shallower water that is slowly showing signs of spring. One of the best tactics for this time of year is to drill lines of holes between the deep water basin areas where we caught crappies only a few weeks ago and the shallow water spawning areas where we can find these crappies a few weeks from now. Somewhere along that line, those crappies will be found as they make that migration. Shallow bays with dark bottoms will be some of the quickest to warm as the late ice season period sets in. Based on this, these types of bays will also be some of the first to sprout fresh weeds and see increased insect activity. Logically, these will be some of the first areas that crappies will begin moving into as their transition begins. This late season can also be marked with great variability, warm days followed by cold days. Spring-like weather patterns are becoming more frequent, but winter does not want to give up without a fight. These frequent “back and forth” weather conditions can have late ice crappies in flux a lot of the time. Sliding up into the shallower waters during stable weather and dropping back off to deeper water as pressure rises. For this reason, these shallow, weedy bays that are located adjacent to deeper water are always a good bet for finding late ice crappies. As mentioned earlier, the ever-increasing meltdown is bringing warmer water and nutrients into the lake via runoff. This runoff will also begin to create current as it flows into the lake. This current is a great indicator to the crappies that warmer water, green weeds and food are nearby. For this reason, these late ice crappies also tend to be drawn to areas where there is some form of current. If you can identify areas that combine all three of these elements: shallow, dark bottomed areas, adjacent deeper water and streams or creeks that feed into them, you’ve probably just found a likely hangout for late ice crappies. It’s very important to fish the entire water column when chasing late ice crappies. Unlike the mid-winter period, when it is fairly common to find a suspended mark, drop the bait to just above that mark and jig the fish up, late ice crappies can be found anywhere in the water column…. often times very high in the water column. In fact, it’s very common to catch them directly under the ice as ice out approaches. As quickly as things are changing for the crappies below the ice, things are changing on top of the ice for the humans that pursue them. Warmer days and fewer hours below the freezing point in the evenings means that the ice begins to slowly melt from the top down. On really warm days, there can be lots of standing water on the ice. This is unnerving to lots of people, but water standing on the ice is actually a GOOD thing. As ice melts it starts to become porous. Porous ice is also very weak ice. As long as the ice is non-porous enough that water will still pool on top of it, it means that there is still some structural integrity to the ice. If there is no standing water on the ice on those very warm days, it’s time to exercise extreme caution, because it’s a pretty safe bet that the ice sheet has become completely porous, the water has passed through and there is very little structural integrity to the ice. “Honeycombed” is a term often used to describe ice once it has reached this porous state. If the ice is honeycombed, it is possible that it is still safe for foot traffic, but it takes significantly more honeycombed ice to support foot traffic than it does good, hard, clear ice that most are more familiar with. 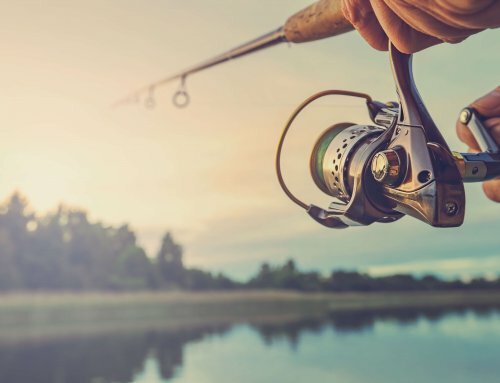 Crappie fishing at this time can be fantastic, but it is up to each individual to determine if the benefits outweigh the risks for themselves. If you do go out on honeycombed ice, a life vest and picks are absolutely essential. The buddy system is also the only way to go for these conditions. Make sure each of you has a throw-able PFD and at least 50 feet of rope. A spud bar or ice chisel is also a pretty good idea to have along because it allows you to check the ice for its load bearing capacity as you go. Even before the ice reaches this porous state, there are some significant changes taking place. One of the first things to happen is the ice is beginning to melt around the shoreline. This is where the water is most shallow, and as such will heat up more quickly in the sun’s rays. Even after the ice has receded a few feet from the shoreline, the sheet of ice covering the rest of the lake can be quite sound. This is the time when many anglers pursuing these buzzer-beater crappies, will “plank” their way onto the ice. “Planking” is simply using planks to bridge the ring of open water at the shoreline in order to access the sheet of ice still on the lake. This practice may seem risky to many, but as long as the ice is constantly monitored to ensure it is still structurally sound, the risks are very minimal. The main sheet of ice can remain sound for a considerable amount of time after the open water develops at the shoreline. Because of the rapidly changing ice conditions, chasing buzzer beater crappies is often done on foot. Since the ATV’s and snowmobiles that served us so well for the bulk of the season will now, more than likely, be left at home, traveling light is the key. At this time of year, I often even opt for an ice chisel instead of an ice auger. The chisel weighs a lot less, holes are fairly easy to chisel in the softening ice and with no-refreeze in the evenings, there are lots of old holes that are open and require neither an auger nor a chisel. I always have the chisel with me during this time of year anyway, since it is such an important piece of safety equipment, so leaving the auger behind isn’t that big of a deal. Any good 3-point buzzer-beater requires a well-created play to set it up. The same can be said for scoring on buzzer-beater crappies, and now is the time to start putting that play together. 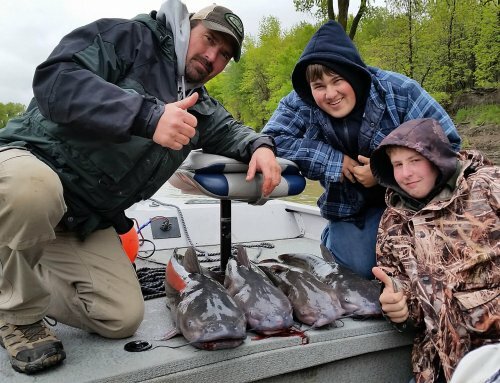 Go over your lake maps and chart out the basin areas where they were found a few weeks ago, then mark the shallow weedy areas where crappies will likely head to spawn and draw a line between the two. 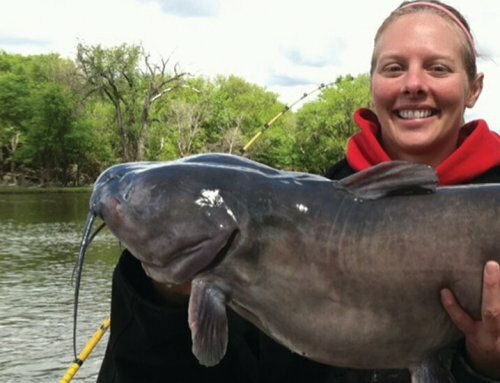 These are the places to start drilling once those crappies disappear from the basins. Somewhere along those lines you will intercept those transitioning fish. As ice out draws even closer, follow those lines closer to the spawn staging areas and you should be able to stay right on top of the fish clear up to ice out. Whether we like it or not, our hardwater season is very near its end. Beginning to create your buzzer-beater play now means you’ll be ready to execute it, like any good coach would, the instant it’s needed. Nothing but net!